This accident between a Lamborghini Gallardo Spyder and a Mazda 323 recently occurred on the corner of Snake Road and Voortrekker Street, in Johannesburg, South Africa. The Lamborghini suffered a decent amount of damage to the front, but it should be easy to repair. Although Johannesburg is considered one of the most dangerous places in the world, there are many wealthy people driving exotic cars here. 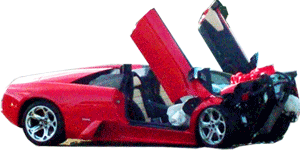 During the past decade, there have been 32 accidents involving exotic cars in this location.